This large clay Nativity contains 11 hand-painted pieces: Mary, Joseph, baby Jesus, an angel, two shepherds, a donkey, a cow, and three wise men. The figures are hand-painted with floral designs. Joseph is unique because he holds a dove. The Joseph figure stands 8 inches tall. 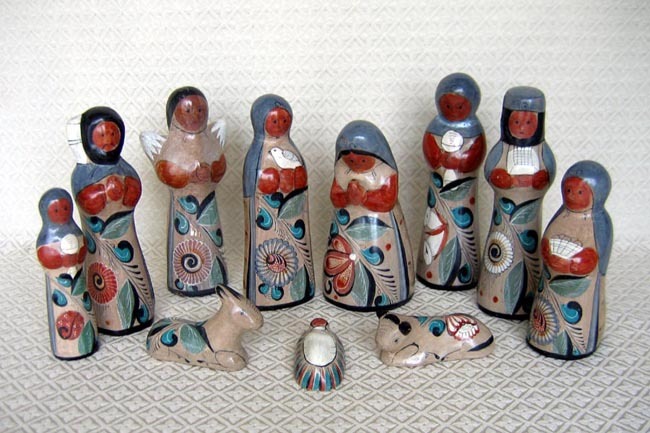 The set come from the state of Jalisco, where an old ceramic tradition—an inheritance from pre-Hispanic days—has led to the fame of the towns of Tonalá and Tlaquepaque for the production of Nativity figures. In Tonalá, pottery is still made using ancient traditions. On Sundays the town has a ritual to gather at the Tiangue to select the best chunks of clay from the local clay beds which hold many different types of mud ; red, black, white, beige. The clay is ground in a mill to a fine dust. It is then dampened and left to ferment and then mixed with water.